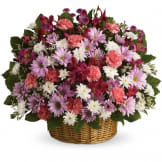 Feminine and beautiful, this basket arrangement in shades of pink is the perfect way to honor the sweet memory of someone close to you. 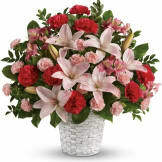 • This stunning bouquet includes pink asiatic lilies, pink alstroemeria, hot pink carnations, pink minature carnations, salal, and huckleberry. 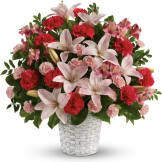 • Delivered directly to the funeral service or the family residence. • Measures approximately: 20" W X 20" H.
Flowers will be received by a Sandra Clark Funeral Home's staff. The flowers were just perfect! 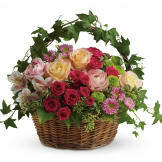 All of our flowers are designed and delivered by hand from a local florist in in Dallas.